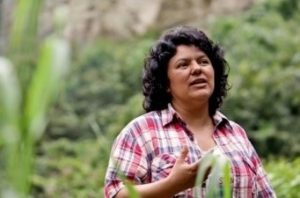 On November 16th, 2015, the Channel Foundation along with grantee partner the Fund for Global Human Rights and others welcomed two globally renowned environmental justice leaders to Seattle: Berta Cáceres, winner of the 2015 Goldman Prize, the world’s largest environmental prize, and Miriam Miranda, winner of the 2015 Food Sovereignty Prize. The events offered Seattleites a chance to learn from these incredible activists about how they fought to defend the rights and natural resources of indigenous peoples in Honduras despite death threats, false arrests and kidnapping. Supporting Environmental Justice: How Donors Can Be Effective Allies to Grassroots Movements (with Northwest Global Donors Exchange (NW-GDX), Pangea Giving, and Jolkona). Discussion: The Way Forward in Central America: Indigenous Rights, Land and Resource Rights, and Grassroots Activism (in Spanish only) (with El Centro de la Raza). 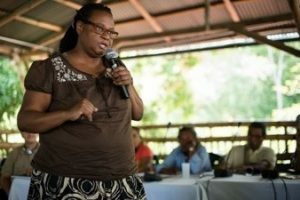 Miriam Miranda, leader of the Honduran Black Fraternal Organization (OFRANEH), has braved detention, tear-gas burns and beatings at the hands of police during her work with the 46 communities of the Afro-indigenous Garífuna of Honduras to defend their territories, natural resources, identity, and land rights.